Isn't it exciting to hear good news about the green movement? The question of whether disposable or reusable dishes are more eco-friendly has been a matter of debate for some time. Although "reuse" is one of the basic 3 Rs of environmentalists, some folks claim throwaways are preferable because no dishwashing is required, thereby saving huge amounts of precious water. What's more, they continue, the use of disposables in institutional settings significantly reduces staff workload -- and the employer's payroll. But now the middle school system in the small city of Minnetonka, Minnesota (population approximately 50,000) has successfully challenged that idea. Learn more about Minnetonka's victory and get the dirt on disposable dishes. Minnetonka Middle Schools (East and West) recently switched from using disposable plastic cutlery and bowls to reusable metal versions in their student cafeterias. They have been carefully watching what happens and have compiled detailed statistics on how the change affects their operation. The results are eye-opening, to say the least. Handling the reusable dishware took only an additional 20 minutes of employee time per day. Costs were reduced by $3,000 for the first year, taking the price of the initial set-up into account. (Future savings are projected at $8,000 annually.) The schools' carbon footprint has significantly decreased, as one small yearly shipment is received compared to monthly deliveries in the past. They produced 6,712 fewer pounds of garbage. 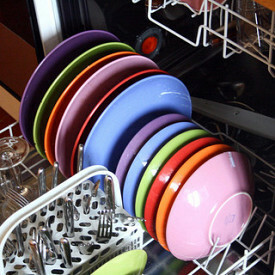 Finally, water consumption has increased much less than expected, with 41.5 dishwasher loads daily as opposed to 38. What Happens to Disposable Dishes, Anyway? After you use them for 20 minutes or so, petroleum-based plastic disposables do not conveniently disappear. Discarded in the trash, they will end up in landfills where, it's estimated, they will take anywhere from 10 to 100 years to decompose. In the process, they'll release dangerous hydrocarbons. A greener alternative would be to collect them for drop-off at a recycling center -- that is, if they'll be accepted. Disposable plastic dishes are usually Resin Code no. 6, meaning they're relatively expensive to recycle compared with other types of plastic. Reusing single-use dishes is not recommended. Their plastic breaks down with washing, making them prone to leach chemicals into your food. What Happens to Reusable Dishes? As long as they don't break, reusable dishes will last many years, perhaps even longer than you do. Possibilities for recycling depend on the material from which the dishes are made. Ceramic dishes are not universally accepted by recycling centers, but may be taken by places which specialize in materials for roadbeds and garden paths. Recycled ceramics are also sometimes incorporated in the manufacture of new dishes or kitchen countertops. Reusable cutlery is commonly made of stainless steel, which is in great demand. An impressive 90 percent of all discarded stainless is recycled to manufacture new items. In theory, sterling silver flatware could also be recycled, or sold as scrap metal. More often, however, it is treasured as a family heirloom or made into jewelry and other decorative objects. Under certain circumstances, it may be difficult to manage without disposables -- for example, on a camping trip or when a snowstorm blowing over Lake Michigan temporarily disrupts your Chicago plumbing. In such a case, look for goods made from sustainable, biodegradable materials. The old-fashioned paper cup, once displaced by Styrofoam, is making a comeback. Paper plates are also great -- reusable holders will prevent the dreaded "plate sag" phenomenon. Sturdier plates, as well as bowls, can be manufactured from sugar cane or fallen palm leaves. Disposable cutlery may be made out of wood or bamboo. Besides their green goodness, many of these dishes are pretty enough for a party. Green Cleaning Basics: Wait, What IS Baking Soda?